In the past for patients undergoing craniotomies and craniectomies, headache was not identified as a significant complication of their procedure. However, there are a myriad of headache- and pain-related issues that arise in the post-craniotomy period. This pain can be acute pain or chronic pain. Acute pain arises in the postoperative period up to 2 months postsurgical intervention. Chronic pain occurs or persists 2 months after intervention and beyond. These headaches and pain syndromes are further subdivided by phenotype, type of surgery, and surgical approach. Focused management of acute postsurgical headaches can improve short-term outcomes and decrease analgesic-related ICU complications. 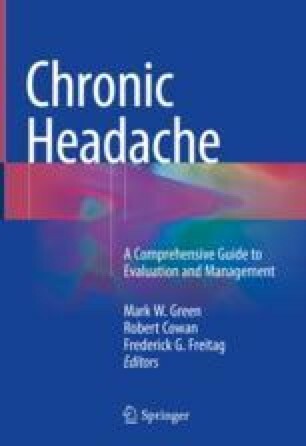 Tailored therapy in chronic headache cases can improve quality of life. Chronic postsurgical headaches appear to mirror their nonsurgical counterparts in terms of therapy. It is important to recognize that these syndromes can arise in the postoperative period. There are a number of postsurgical syndromes associated with headaches that should be identified to facilitate treatment. ICHD-3 beta—the international classification of headache disorders. 3rd ed (Beta Version). International Headache Society, n.d. Web. 15 Mar 2017. https://www.ichd-3.org/.